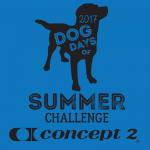 How are you getting on with the Dog Days of Summer individual challenge? Distances are cumulative (you don't have to complete 10,000 metres in one sitting, for instance), and all metres—rowing or skiing, indoors or out—count. Plus, this year, we've added an optional level for kids and adaptive athletes. I have to confess a holiday in San Francisco and time spent on the turbo trainer at home has meant my efforts in this challenge have been pretty slack! On a positive note the cross-training effects of hiking, biking and boxing classes should have me fighting fit for the upcoming Fall Team Challenge in September. The August Cross Team Challenge a 'Bolt from the Blue' set by Fitness Matters is a speedy 200 metres unrestricted row. A simple and effective session that you can tag on the end of a mid-length row after a good warm-up. Have you rowed anywhere exotic this summer? Are you still rowing in the garage because the weather is freezing where you live? Wishing you a great summer ETT'ers. Just completed the Dog Days Challenge, great warm up for the Fall Team Challenge! Excellent work there Les! Well done. Looking forward to rowing with you in September.